Ancient Chinese healers are known for their accuracy in determining diseases and healing techniques which could cure a number of life-threatening ailments. What would they use to detect these diseases? They were not equipped with the modern day technologies. Face-mapping was the method they used. They could detect any disease by reading the face. (a) All the organs of our body are interconnected. If one organ doesn’t work properly, it is bound to affect the workings of other organs. Hence, if any organ is not functioning properly, the face will show symptoms. (b) If the skin of a person is not healthy, there are definitely some issues going on elsewhere in the body. (c) The face is the mirror of our soul. Our internal physiological and psychological conditions get reflected on the face. 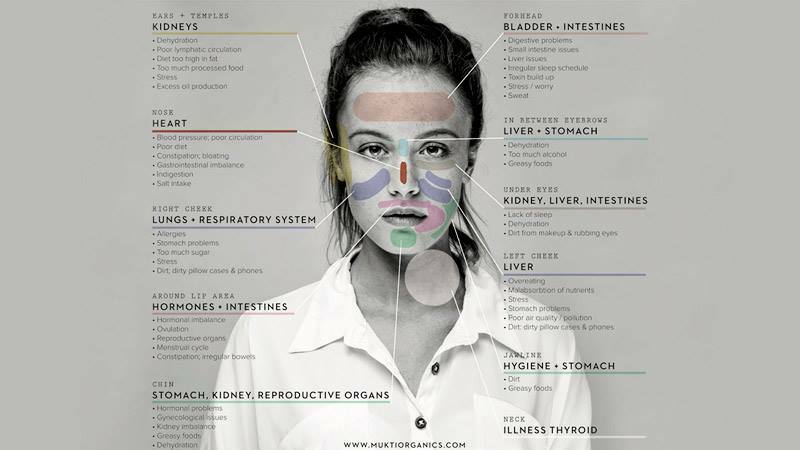 If we are experiencing some disturbance in our internal organs, it will show its signs on our face. The primary method of face-mapping is analyzing the position of acne on the face. (a) you are having a problem because of smoking. (b) there are some bacteria working in the body. (c) you touch your face very frequently. (a) you are consuming an excessive amount of starch or processed sugar. (b) there are hormonal problems within the body. (c) you are suffering from candida infection. (a) you are suffering from stress. (b) you are drinking alcohol excessively. (c) your caffeine intake has become higher. (d) the blood circulation in the body is poor. 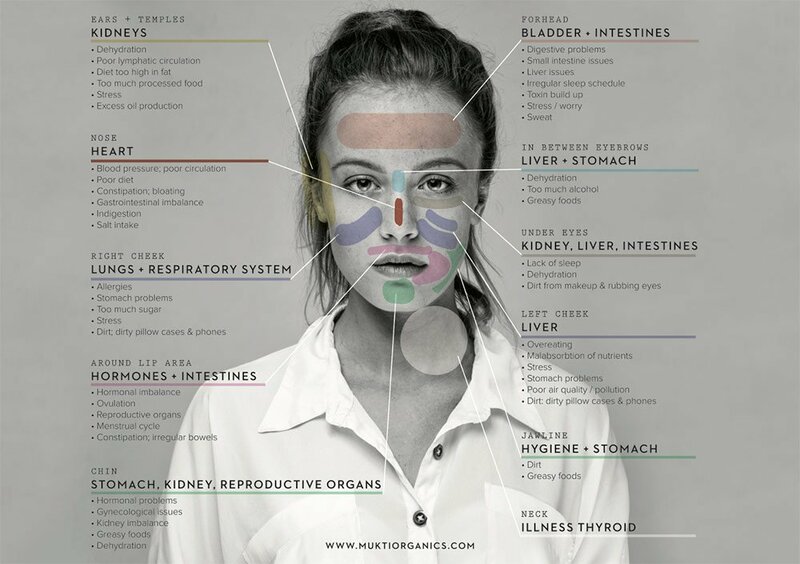 While these are just general symptoms of acne, locating its exact position can help us detect which organ is suffering from an imbalance. Acne on forehead signifies you are consuming too much of carbohydrates and processed food, low in fiber and alcohol. This affects the digestive system which comprises of the bladder or small intestine. Consuming excessive amount of alcohol and stress also renders in low digestion and increase of toxicity. This can be cured by controlling diet, increasing the daily intake of water to 10-12 glass, adding fibrous food to your diet and avoiding junk food and alcohol. Acne occurring in the area between eyebrows indicates that the liver is not functioning properly. This happens because of high consumption of meat. Give your liver a rest. Replace the meat with vegetables and fruits which will help your organs function properly. Also, take a break from work and try indulging yourself in a bit of fresh air and exercise. You are hurting your heart if there is an acne on your nose. Avoid salt and foods high in cholesterol. Maintain a healthy diet and don’t forget to exercise daily. Acne on our mouth and chin reveals that your stomach needs your attention. Stop feeding yourself fatty foods and alcohol. These become a burden for your stomach. Eat healthy food like green vegetables and fruits. Substitute your fried delicacies with soups and salads. If you have acne around this part, then it’s a warning sign that you are suffering from malnutrition and dehydration which affect your kidneys. Avoid alcohol and increase your daily intake of water. You need to quit smoking too if you wish to stay healthy. Acne on cheeks indicates that your lungs and kidneys are at risk. This happens due to excessive smoking, consumption of alcohol and poor eating habits. Quit these harmful habits and start eating properly. Imbalance in hormones can be determined by acne around the jaw and neck. Consuming too much of salt, caffeine, alcohol and seasoned foods will not let your hormones function properly. This will trigger a lot of health issues including the increase in stress level, anxiety, and depression. Drink water regularly ( at least 10-12 glasses per day) and focus on eating healthy.